Mikel looking for showdown talks with Ancelotti? It's seems that Mikel isn't happy these days at Chelsea after losing his place in the Chelsea side. For much of last season Mikel was a starter and got used to being an important part of the side that won the double. This season with the emergence of Ramires, It seems that Mikel has lost his place and isn't happy. If reports are to be believed he wants to have a word with Ancelotti. "John Obi is very unhappy. He is 100 per cent fit but is being overlooked and is too good a player to be sitting on the bench or, worse, in the stands. He can't understand it as he was one of the first names on Carlo`s team-sheet last season when the team won the Double. He needs to play more. 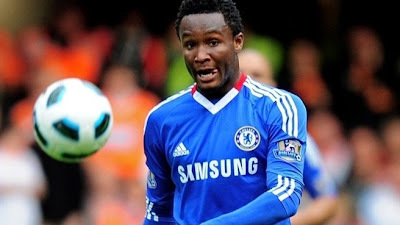 He loves Chelsea but he may have to leave Stamford Bridge in the summer if he is no longer a part of Ancelotti`s plans. I guess it's only natural to feel like that if you lose your place but it's up to you to rise to the challenge of competition for places, raise your game and force your way back into the team. I have gone on record on here by saying that I do really rate Mikel and I know there is a difference of opinion here. He very rarely gives the ball away, more often than not comes out of tackles with the ball at his feet and his productivity with the ball is getting better all the time. I really do believe that he is good enough to play for Chelsea as he proved that last season so it's now up to the player to prove it once more and force his way back into the side. Mikel still has an important part to play this season.